(Lanka-e-News- 10.Nov.2017, 3.10PM) Was the Lanka e news website news reporting obstructed on a court order? Or on the instructions of an individual ? 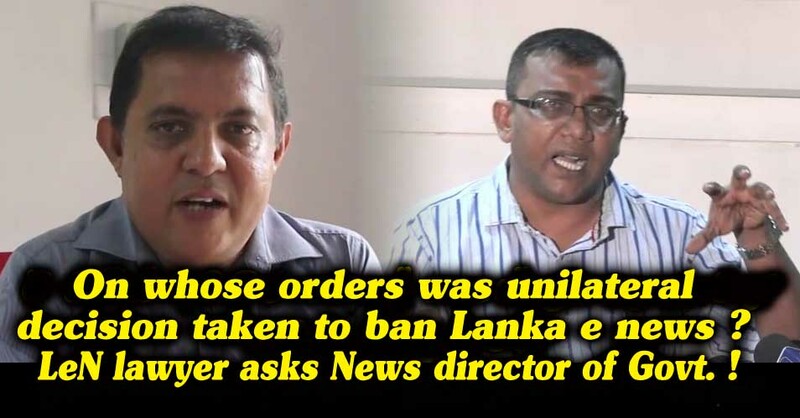 Lawyer for Lanka e news Upul Kumaraperuma had questioned in his letter addressed to lawyer Sudarshana Gunawardena , the Director General (news ) of the government. The full text of the letter that was sent this afternoon is hereunder …. I am writing on the instructions of my client , Sandaruwan Senadheera the chief editor of Lanka e news website www.lankaenews.com . Based on the information conveyed to me by my client , the news website under the name of ‘Lanka e news’ is engaged in publication of news pertaining to the spheres of politics, art, sports and foreign news , and it is the first Sri Lankan news website . Moreover it has earned the reputation as a foremost news website publishing articles in Sinhala, Tamil and English .In addition the news website made a major contribution towards the political upheaval in the country in 2015. In the year 2011 too during the Rajapakse reign this website was blocked similarly . It came to light, that ban was imposed by the Telecom Regulatory Commission (TRC) Director General at the request of B.V. Ganepola who was the secretary to the ministry of mass media and information at that time. Thereafter , the main office of the same news website was set on fire reducing the entire premises including the library to ashes owing to this violent criminal action. In the same year Prageeth Ekneliyagoda who was working for Lanka e news website was abducted , and finally went missing. Owing to the dire political situation which prevailed in the country at that time, my client in fear for his life had to flee the country for security reasons. I am also further informed that the news website of my client has been critical of certain actions and decisions taken by the government , specially the prospective purchase of a warship from the Russian government. Subsequently when the news report was confirmed , and the subsequent publication of news reports for some days , on the 8 th of November the news website of my client had been obstructed from access within SL . My client also says banning a news website in this manner cannot be done by a political party ,and has been imposed by a responsible division of the government . He has also conveyed to me that this ban has been imposed within Sri Lanka , as it was accessible in other countries as usual and there were no internet flaws in Sri Lanka (SL) on the 9 th of November , 2017. According to my client , this obstruction of the website on November 9 th and until 10 th morning , was not communicated to him by any notification nor was any explanation called from him. Neither were any notification of any other sort given to him , and this decision to ban has been taken unilaterally . Based on the aforementioned reasons, the instructions received by me is , if the www.lankaenews.com website ban has not been imposed following a court directive , and if the imposition was done at the behest of another Institution or an individual , to inquire into , on whose orders this ban was imposed and on what grounds? In the circumstances I shall appreciate if you will kindly furnish me with the necessary information in this connection.